If the unexpected happens, rest assured that we’ll have you back on the road quickly, with our national breakdown and mobile service support available 24 hours per day, 7 days a week. Breakdowns can have a significant impact on your fleet productivity. You need confidence that you will receive the assistance you need in a timely manner, in order to minimise disruption to your business. Our in house National Breakdown Service team are trained to diagnose vehicle defects over the telephone, ensuring that we dispatch the right technical support to get you back on the road. Operating around the clock, our integrated service covers all of your vehicle and ancillary equipment. 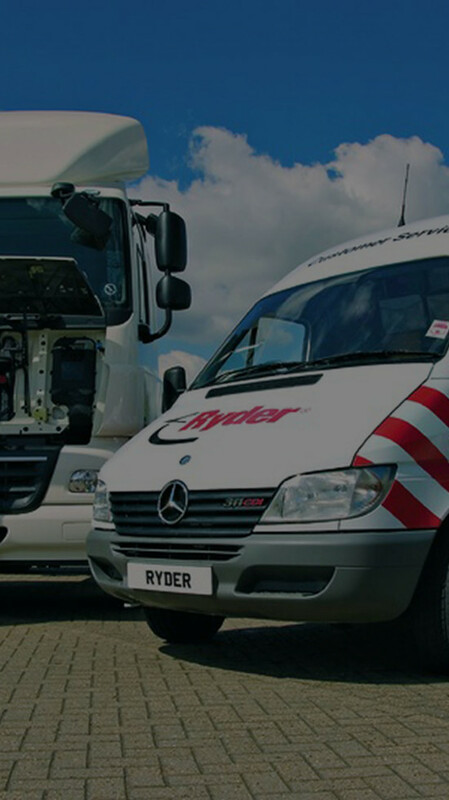 We maintain tight control of our response times to ensure that we reach you within 60-90 minutes and continually achieve a 90% road side fix rate. Fully- equipped mobile support vehicles using only genuine OEM parts. You’ll never be off the road for long. Ensure maximum uptime with a support network of over 300 workshops and our mobile maintenance service. Your time on the road is optimised through careful monitoring of your tyres at each inspection to maximise their life span. Know your fleet is safe and your costs are under control, with telematics technology to track location and performance data. Please tell us about your contract hire needs so that we can pass your enquiry on to the relevant team. What type of vehicles are you looking to add to your fleet? How many vehicles and/or trailers are you looking to add to your fleet? Yes, Ryder may email me to provide me with information regarding business solutions, services, promotions and events.